It makes me happy to see that I have stuck with this, and it has helped lead me to discover that writing truly is my passion. Today I do not have a poem for you, but instead something I read and my thoughts about it. This comes from the book Direct Truth by Kapil Gupta. Perhaps it is when two people come to learn that they no longer need one another, that they can then have a lasting relationship based only on the joy they bring each other. It is a hard and emotionally demanding lesson to learn, and there is no time-frame associated with it. Just as the person asking the questions in this book mentioned how this is the opposite of everything they have ever heard about relationships, the same went for me. I believed in a relationship where one person should be able to rely on the other. But when you remove that need- you are left with something you both can appreciate even more. Enjoyment. They can still be your shoulder to cry on, they can still be the many things that you once believed you needed them to be. Once you realize that you can survive without them, that is when you can appreciate all of those things they can do for you even more. I’d like to thank you all for reading throughout the past year. I hope to continue to learn more about the Truth and share it with those in the Universe that wish to hear it. And of course more poems! And of course more books! 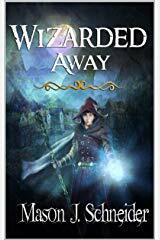 Previous Post Get My Book Wizarded Away 🧙‍♂️ For Free On Kindle!